I'm Hannah, your resident farmer and I am so glad you found us! If you are here, it means you are looking for a local source of Nourishing, Clean, Healing food, for your family and you are ready to change your health and your life for the better! First let me tell you how having access to food with Superior Nutrition has changed my life. Growing up I had, severe asthma, terrible allergies, and if that wasn't enough, at 17, I was diagnosed With Juvenile Rheumatoid Arthritis. This was a huge blow, as I was an avid equestrian. For years I had struggled with the pain and inflammation my condition caused. I tried several medications & refused others due to possible life threatening side effects. I went to doctor, after doctor, I tried supplement, after supplement. By the time I was 21, when I should have just been getting my life started, I couldn't get out of bed without a handful of Advil. I was always exhausted and had no energy from fighting the pain. I was in a down hill spiral. A friend suggested I try switching to Raw milk. I was eating what I thought was a healthy diet (boy was I wrong), but I figured what the heck and I gave raw milk a try. Soon after I started drinking raw milk I noticed, I needed my inhaler less, my allergies weren't terrorizing me & I didn't need the Advil anymore. Then my raw milk lady went out of business. I couldn't get raw milk, and within weeks all of my symptoms started to return. Desperate for the raw milk my body needed I bought a milk cow and then a small farm. From there my farm grew. As I continued to add more nourishing foods to my diet my health continued to dramatically improve. 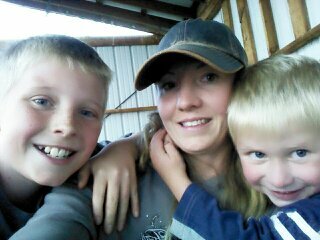 Even my Nephews' health improved after staying on the farm with me, Completely relieving their eczema and allergies as long as they ate food from our farm. Since then it has been my personal mission to operate a sustainable farm to provide, nourishing, healing, clean food, with extraordinary flavor to my community. I am so Happy I can share this with you all and I look forward to being your farmer! Click the Button Below to sign up for our newsletter and to get access to Real, Nourishing Healing Food for your family Today! Yes! I want Real Food! Why did I and thousands of other people like me, experience such a dramatic shift in our health after switching our diets from super market food, to locally grown, whole foods, from holistic farmers? To understand why this is happening first you need to understand the state of the food production system in this country. I think one of my mentors, Joel Salatin, puts it best. Our country's agriculture system asks how do we grow food, faster, fatter, bigger& cheaper. There in lies all of the problems with modern agriculture and our food system. The fact is, the system is nutritionally, and ecologically, bankrupt. We don't have food in our stores anymore, we have food like products! Nutrition, followed by natural flavor, are on the bottom of the list of qualities that mega ag producers strive to produce. Their systems are dependent on artificial chemical inputs, our veggies and grains are grown on soils that have been stripped of their nutrients for decades. Pigs and chicken are grown in confinement buildings with thousands of other animals, no sun shine, no fresh grass, no freedom. They are fed corn, soy &wheat (same grain we eat) that is grown on the denuded soils, and then sprayed with toxic glyphosphates, which kills plants by preventing them from absorbing nutrition and tying up minerals. In order to keep the animals alive with poor nutrition and overcrowding they have to feed them antibiotics from the time they are born, which in turn leads to the creation of deadly antibiotic resistant bacteria. Even beef and dairy cattle are kept in huge feed lots and confinement operations, they are fed waste and by-products. Then they are shot up with steroids, hormones and antibiotics so they can produce more meat and milk, again producing nutritionally deficient, flavorless, inferior food. Rocky Ridge is different from most farms. We manage our farm from a holistic stand point to build health through nutrition. All of our animals enjoy sunshine, grass and fresh air every day of their lives. Together we can build healthy people and a healthy planet and we welcome you with open arms to our farm family.